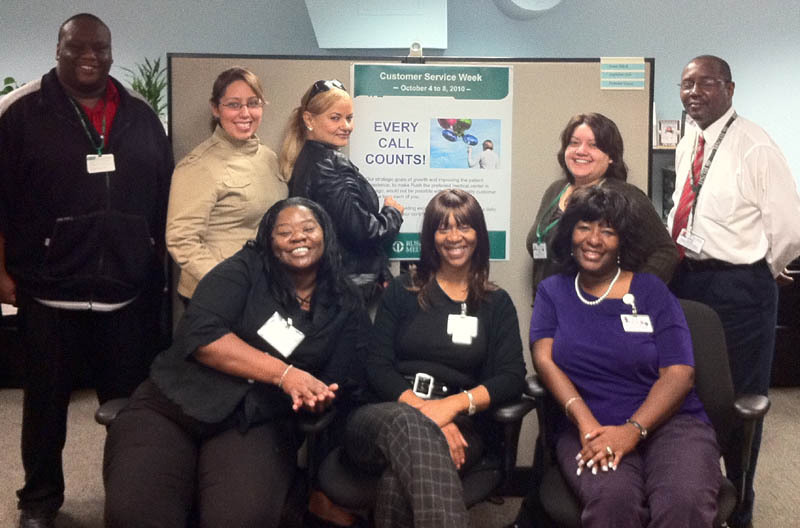 The Rush Physician Referral Services team. Back row, from left: Jermaine Evans, Rosie Hernandez, Judy Ramos, Rosa Vargas, James Black. Front row: Tammie Richardson, Stephanie Cole, Helen Speights. Have you ever experienced service so bad you vowed never to return to that store? Have you ever avoided a certain restaurant because your friend told you about the terrible service there? It’s been said that it takes around 12 positive service incidents to make up for one negative incident, and the average business spends six times more to attract new customers than it does to keep old ones. People’s impression of Rush often begins before we can directly communicate with them, and customer service is a chain of events that can begin on the phone or Web and continues through the parking garage, the people they encounter in our halls on the way to their appointment and into the clinical setting. Given Rush’s vision to be the medical center of choice in Chicago, we in Physician Referral Services focus on customer service and practice Rush’s values every day in hopes of being a consistently strong link in Rush’s customer service chain. The PRS team answers all the calls that come into Rush’s toll-free number — (888) 352-RUSH (7874) — and Rush Oak Park Hospital’s line — (708) 660-4636. Our customers rely on us to help them with a lot of things, including finding the right physician, making appointments, registering them for a class or event or providing general information about Rush. This means we are often the first point of contact for many new and returning Rush patients. We have the potential to be instrumental in guiding a person through a pleasant experience with Rush right from the beginning. Rosa Vargas: “Customer service to me means professionalism, promptness, friendliness and willingness to listen to the callers. Also, going above and beyond the norm gives me great satisfaction. Karen Clayton is manager of Physician Referral Services at Rush University Medical Center.